So the Silver Surfer is running around the Impericon in disguise, hiding his silver coating and cosmic power, while he looks for Dawn Greenwood, who has been helping save all the prisoners. The Surfer and Dawn find the Never Queen’s stolen heart, which is powering the Impericon. 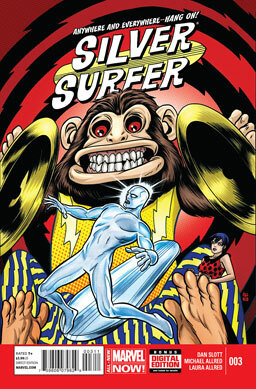 Once it’s disconnected, the Surfer will have to power the Impericon himself to keep it from collapsing before everyone’s evacuated, and Dawn takes possession of the heart, which shrinks down into a creepy drumming monkey toy, for some reason. Can the Surfer save everyone on the planet? Can Dawn save the Never Heart? Can they stop the Incredulous Zed from executing the Never Queen? Verdict: Thumbs up. An outstanding, adventuresome, humor-filled story with wonderful artwork. It has great moments big and small, but perhaps my favorite is Dawn giving the Surfer’s board a name. Hope it sticks, too. Axe Cop and his team are being attacked by axe monsters, and they’re too powerful to fight off, forcing the team to flee, disguising themselves as campers. Axe Goat infiltrates the villains’ hideout and discovers they’re actually all demons. The demons and axe beasts attack again, all backed by Satan himself. The axe beasts turn on the demons and take over their bodies, and the American Choppers have to flee again. They all go to visit Captain Axe’s uncle, who kills Axe Cop with poisoned cereal. Is Captain Axe a bad guy? Can anyone save Axe Cop? Verdict: I hate to say it, but thumbs down. It’s all a little too self-aware, which may be an ongoing problem now that the writer is getting old enough to be aware of how goofy these stories are. And self-awareness is really not a good thing for this series. 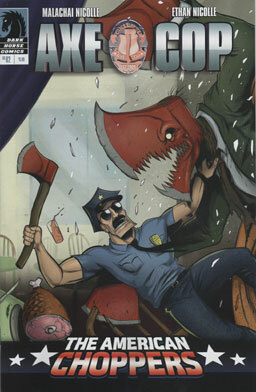 Y’know, I enjoyed the early online Axe Cop, but even the first comic book series seemed too self-aware. Axe Cop makes everyone poop their pants? I did like the illustrations for Captain Planet in the first issue of the current series. I doubt I’ll pick up this one. Yeah, I’ll finish out this series, but I probably won’t pick up future ones.